What can I say about Goa that has not already been said multiple times over. 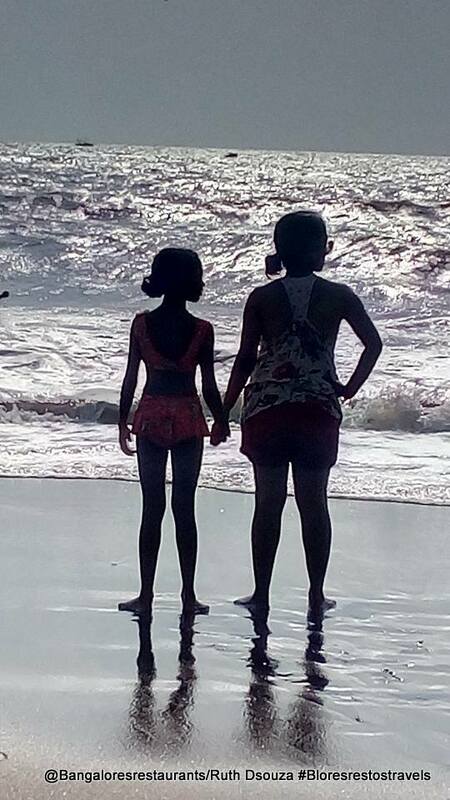 I have done the length and breadth of Goa as a child, a teenager, a youngster and as a mummy myself. Stayed at hotels, resorts, homestays; eaten at every conceivable place from beach shack to star hotel, yet the charm of the place never fades away. 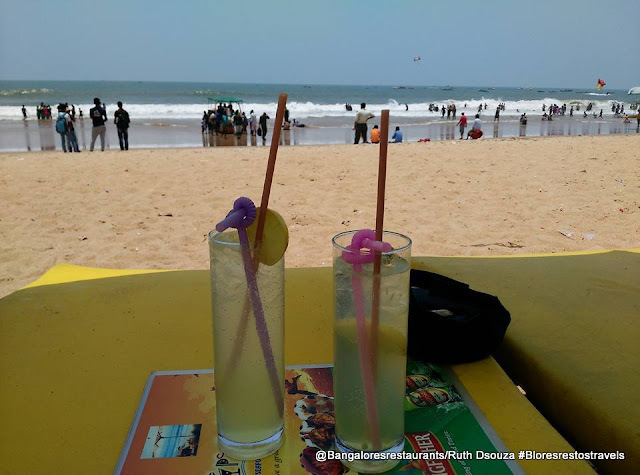 It was a while since our last visit to Goa... after all, there are other places to visit too! This time round, we flew one of the early morning red eye flights out of Bangalore and landed at a very nice breakfast time of around 8AM. What I love about early morning flights are the fact that you zip through the city to the airport in less than 35 minutes (am talking of Jayanagar to the airport). We also made use of BIAL's long term parking facility where we left our car for 4 nights. Turns out that this is a much more economical deal than cabbing it both ways. 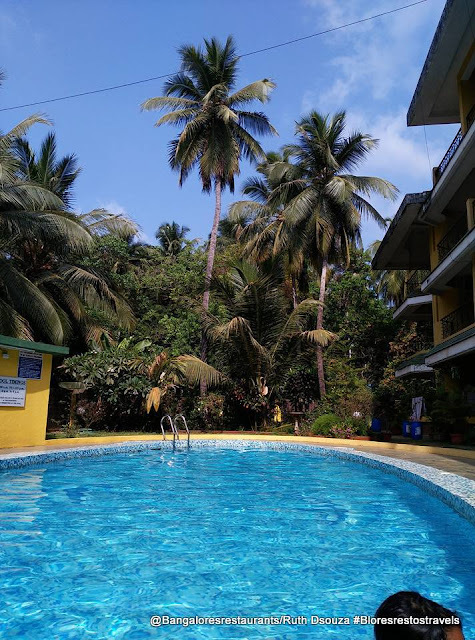 Once we hit Goa, we headed out by pre-paid cab straight to Arpora where we were staying at a family friend's service apartment. This was the first time at this service apartment and boy was I really happy about the choice we made. I unfortunately have no pictures or videos of the place except for what you see below. But let me give you a 'verbal visual' of the whole place. The location is beyond brilliant considering that Calangute, Baga and Anjuna beaches and all the great things that surround them. Bernie and her husband, who manage the place are an extremely helpful couple going out of the way to make suggestions on places to eat, shacks to visit, gigs to catch and things to do. Bernie was also kind enough to suggest a place close by where we could hire a bike for the next couple of days because that was the one and only plan. Sudhakar wanted a Bullet and a Bullet was what he got. I found it a bit pricey for Rs 800 a day considering Activas are available for as little as Rs 250 a day. But, on every holiday you have an indulgence and this was ours. The apartment is a large 2BHK space with three balconies. While the master bedroom has an attached bathroom, the second one makes use of the common one. Both bedrooms are air conditioned. The kitchen is decently equipped and there are grocery stores close by if you want to whip yourself up something any time of the day. Save for tea, coffee and the one off Maggi, we did not touch the kitchen. I was happy about the Aquaguard fitted in which meant that we did not have to buy bottled water everywhere. Tata Sky for entertainment and geysers for hot water all the time. The master bedroom also had a roll out bed which worked very well for us considering we had Anoushka. The apartment is great for the small family like us or a larger group of two families. Sightseeing was not really on the agenda, neither was heading out the city center. Eat, sleep and be potatoes on the beach was the plan. And of course, for little A, the very clean swimming pool of Jade Garden was all she needed to complete her Goa trip. From 8AM, when the pool opened till the last possible minute before we headed out, she spent her time in there. So did we! The 10.30AM view of Jade Garden from the pool. Our apartment overlooked the pool and was on the first floor making it easy to supervise Anoushka for a short while till we got down there to be with her. Our ride for the 3 nights that we were there. 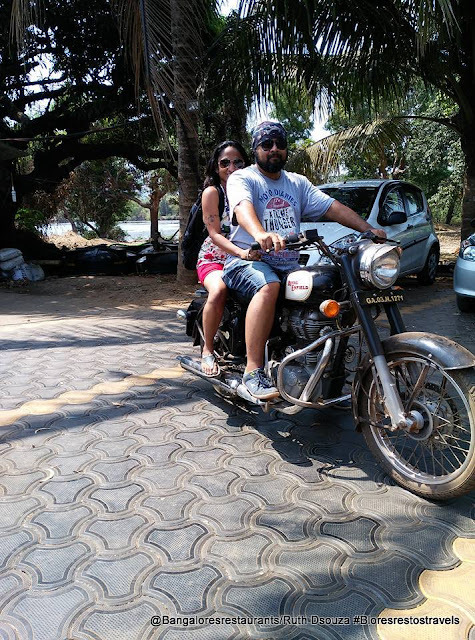 It seated all three of us comfortably and we truly got into the spirit of Goa on each ride. 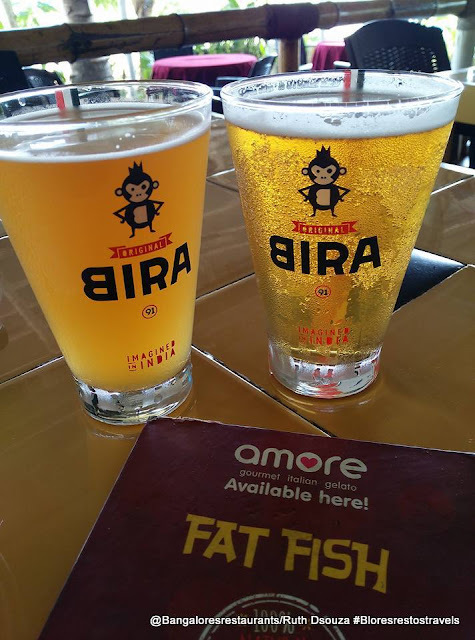 To our total delight and absolute surprise, Bira was available on tap literally everywhere we went. Bliss couldn't have looked any better. Of course Bernie's suggestion of the Fat Fish for a lunch was bang on. A must visit place. 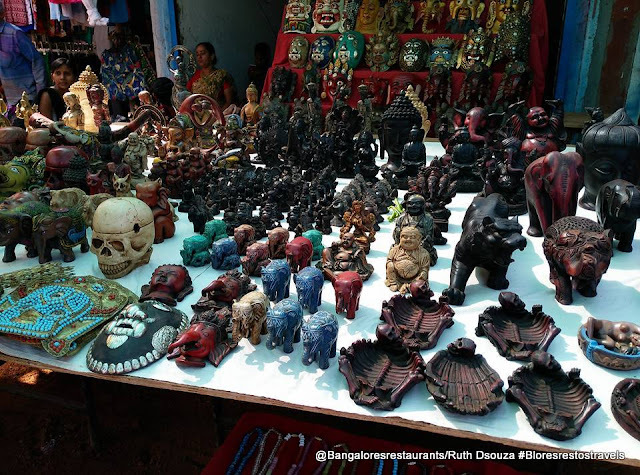 Just for a lark we headed to the Anjuna Flea Market that was on, on the days we were there. Sudhakar brought on his ace game as far as bargaining skills went and we got ourselves some pretty little things. Anjuna Beach was a total disappointment. Nothing like how I remember it from a few years ago. It is now dirty, the waters are quite nasty and the hawkers can drive you nuts. We settled on the beach beds of Janet and Jack's and so close were we to the water that at one point the waves came and washed our shoes away. Thankfully grabbed them all and placed them on higher ground. Calangute on the other hand, for all its commercialization was where we had the most fun and that's the beach that you see in the picture above. Anoushka was under-age and under-height (maybe I was too!) for most of the water rides and seeing how rough the waters were I wasn't really going to venture in. We settled at Tipsy shack, which was basically the first one in the line. For Rs 300 we got two sunbeds with two large clean towels to ourselves till 5PM. We were at the beach from 11AM to 4PM. I made my first acquaintance with Mr. Tom Collins and it was love at first sight. Anoushka and I spent most of the time in the water, which resulted in a tan that was show off worthy! Food, glorious food was all it was about for us at Goa. This time round we explored Fat Fish, You and Me, Nick's Place, Baba Au Rhum, Infantaria and Sakana, along with Janet and Jack's and Tipsy. Click on the photo above for the FB link for more details on all the food we ate. Of course Goa is always calling... the beach is a place that I am always at total peace. 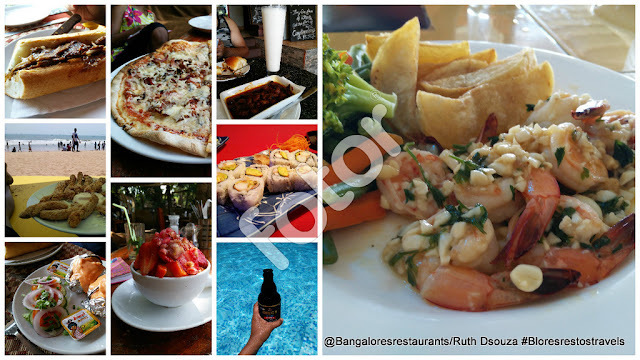 So till we head out there again, I will keep adding to my list of places to visit in Goa. It is a place that never fails to please and surprise!